Should I Let My Tenant Break the Lease? There are a number of reasons a tenant may want to break the lease: relocation for a new job, a chance at buying a home, or unexpected expenses that force them to move in with family. But lease-breakers can cost both time and money, and you may not have calculated that into your profit goals for the rental property. Should you allow your tenant to break the lease? To answer that question, a landlord must fully consider what’s at stake. On the one hand, the lease is a legally binding agreement — an asset, if you will. If you allow some tenants out of their obligation but not others, you risk a claim of discrimination. If you freely allow everyone out of the lease, your turnover costs may skyrocket. On the downside, in most areas a landlord is required to make a reasonable effort to find a new tenant whether they agreed to the early vacancy or not. If the landlord takes the lease-breaker to court, the judge may only allow compensation for the time the unit is actually vacant, along with any damage caused by the tenant. The tenant who wants out early expects to lose their deposit, so they are more likely to damage the unit or abandon it and not pay the rent anyway. Finding and bringing the tenant to judgement costs money, which may or may not be recovered. Once the tenant feels backed into a corner, they likely will try to dredge up some reason why they were justified in leaving early–poor repair records, pest control problems, faulty heating or air conditioning. Occasionally, a tenant will falsely report building code violations in an attempt to discredit the landlord’s claim. While an early termination fee charged to the tenant may seem like the middle ground, some legal experts warn that the fee charged could be deemed excessive if challenged in court. In fact, an Ohio law firm currently is advertising on the Internet for tenants who have paid early termination fees and want to sue their previous landlord. The legal arguments against lease termination fees rest on the fact that the landlord has a duty to find a new tenant, and may be profiting by collecting “rent” from two tenants at once. Lawyers also argue that the landlord may have breached the lease by providing poor property management before the tenant moved out, and therefore is not entitled to full compensation. 1. Never allow an early lease termination. If the tenant leaves, find a new tenant and pursue the old tenant for the difference. 2. Agree to early termination, either in writing or verbally, so long as the tenant remains accountable until the property is re-rented. The landlord only collects the actual amount owed, so there’s no claim for illegal fees, and the tenant has incentive to keep the property in good shape and not sabotage the efforts to get a new tenant. 3. Anticipate lease-breakers and include a set fee in the lease based on the estimated time it will take to get someone else in there. This clause can included specific, acceptable reasons for early termination. The fees should be reasonable based on the actual loss. It is important to note that military personnel and domestic violence victims may be allowed to break the lease without consequences in some circumstances. Keep in mind that once you start to negotiate an early termination or accept money from the lease-breaker, you may be changing your rights and responsibilities under the lease. Consult an attorney if you need guidance. Many property managers we speak with do allow some manner of early termination, especially where they fear there is potential for property damage–which can cost more than the vacancy, or if the tenant likely will abandon the property and be difficult to track down. What do you do when a tenant wants to break the lease? I have encountered this a number of times and my old policy was to have the tenant do the showings while I did everything else to find a new tenant. They were allowed to leave without any cost to them if a new tenant was lined up to move in when they left. This worked very well most of the time. Then one tenant pulled out and decided not to help with the showings which meant I had to do it all by myself. I found a tenant (lined up to move in as she was moving out) and told her that she would have to pay a one month penalty for not participating as she agreed. This turned ugly as she felt she should pay nothing. In the end she agreed to pay $175 (a small portion of her monthly rent) and left without consequence. Since this experience, I have decided that I will simply charge an administration fee and not ask for the tenant’s participation. I have written this into the updated lease form. I am not sure if this is “legal” in the eyes of the LTB as I can’t find anything in the RTA but I am guessing if there is nothing in there than it is not illegal. It could be argued that I am collecting money from two tenants for the same apartment but that is not one I am doing. I am taking money from a tenant who is breaking a contract with me because they are creating extra work and time is money. If every tenant broke their lease half way through I would spend more than twice as much time finding new tenants – the most time consuming aspect of managing rental properties for me. In Illinois when a tenant tries to break a lease 9 out of 10 times the law sides with the tenant. You can withhold their security deposit under the reasoning of rent loss..HOWEVER…be very careful when you do this. You still must provide the tenant within 30 days of vacancy an itemized list of what you are keeping the money for. If you do not and the tenant takes you to small claims court you will have to owe DOUBLE the security deposit. Regardless if they broke the lease legally or ilegally. 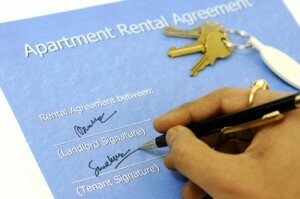 Tenannt-Landlord law in Illinois is usually in the favor of the tenant. If they walk away for legal reasons like building codes not fixed or as a landlord you broke the Utility act by not disclosing common utilities that appear on their bills or failed to pay a utility you are contractually liable for you are screwed. You cannot hold their deposit. Period. Just find a new tenant, accept your lease is faulty and move on. Hi . I have rented my brand new house to a couple . They both signed the lease agreement for a period of one year . They broke the lease after 6 months and left me with damages . They didn’t pay even for water . I have 6 signed cheques from them can i deposit one of those cheque for damages . Previous post: Will New Finding Change Landlords’ Liability Concerning Bedbugs?